A great cooking class. 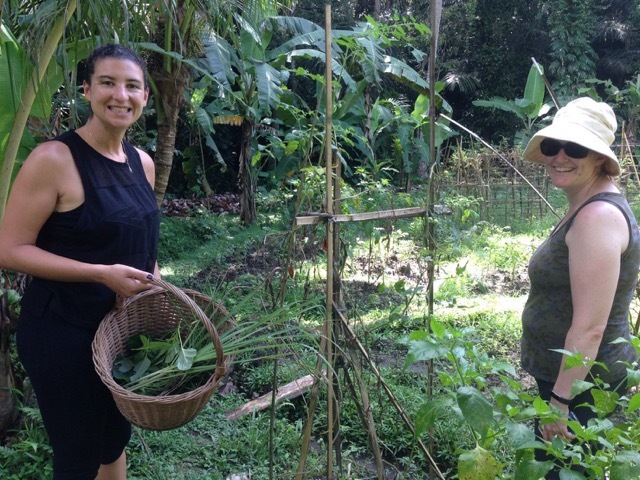 Our yoga guests from Australia getting introduced into the secrets of Balinese cooking and delightful spices. First they visit the gardens and harvest their own veggies before cooking. A wonderful introduction to Experiencing the Heart through Permaculture at Jiwa Damai to a group of teachers from an international school in Bali. They were excited, engaged and involved into much hands on learning. An initial step was a Heart Mediation, and then to introduce various fruit and plants at Jiwa Damai while walking through the Mandala and Butterfly garden to taste, touch and feel. In between theoretical learning about the inherent ethical values of experiencing the Heart Through Permaculture, about people care, earth care and sharing surplus. Hands on with making compost and preparing the earth to receive the plantings was participated in with great enthusiasm. Introduction to "Finding your Heart through permaculture"
A wonderful weekend, an introduction to "Finding your Heart through permaculture " for the teachers at the international school in Seminyak took place at Jiwa Damai. They were introduced to the Heart meditation and then to the principals of permaculture in a presentation. Join our program in December! We want to share with you all the love and the kind words that we have received from our guests. Sometimes it's hard to describe what Jiwa Damai is, so we let them! Permaculture provides a design system which allows to move deeply into our abused eco-systems and release its inherent potential. Ethics of earth care, people care and sharing surplus are one of its unique contribution in our today world. They actually point the way to a new paradigm, from survival and lack of, to abundance and sharing. Permaculture caught my attention quite a number of years ago, when searching for a system to develop the Jiwa Damai gardens in Bali. The book that introduced the practice touched me deeply. I came to respect permaculture’s inherently intelligent and wise approach to regeneration as a way to return to a healthy balance with the earth as a living being. For the past 10 years, I immersed myself into Bill Mollison’s design concept, translating it by learning through doing into our beautiful Jiwa Damai garden. Over time, inviting known teachers, participating in various trainings, and delving deeper in its principles and methods, I introduced permaculture training into Jiwa Damai’s/Lagu Damai foundation educational offerings as well. This was a first in Bali. A local priest and artist, famous for his sacred paintings and drawings of the various Hindu gods and goddesses, offered to teach our volunteers and participants of the Yoga teacher training the very special form of intricate painting. After he arrived, he first made some offerings at one of our temples. He then explained the symbolic of the pictures and the meaning of the various details of the gods. Our class was highly focused. As you can see, the result is breathtaking. 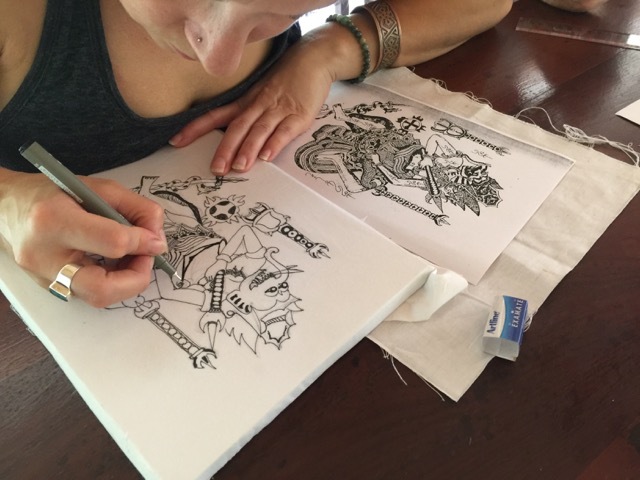 The paintings will be taken home, framed and are highly valued in Bali as protection. Jiwa Damai and Lagu Damai Foundation Bali offered a health day to the village in cooperation with Kula group Karma day. Everyone helped and participated. It took place in the Bale Banja, which is the communal meeting hall. A slide show was presented with healthy foods preventing high blood pressure and diabetes. 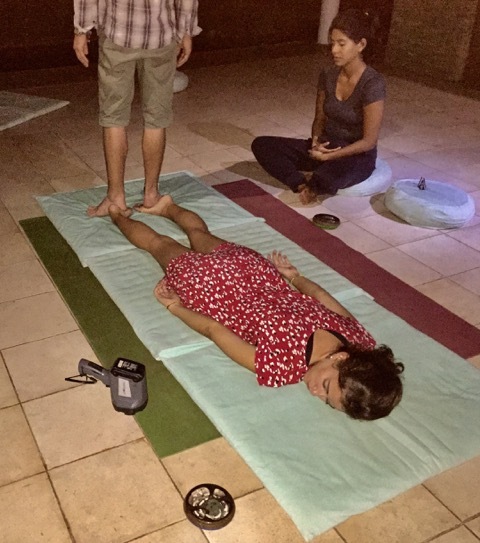 Yoga exercises were included and a buffet prepared by the Jiwa Damai kitchen and Jiwa Damai volunteers, consisting of Balinese chicken, a combination of small picked chicken meat with lots of lemongrass, peppers, onions and garlic and ginger. A huge cabbage salad with our special honey mustard dressing as well as lost of sprouts in there. Green salad was also present. We offered a garden tour during the moment the rains stopped for a moment. Margret took our Kula Collective Yoga Teacher Training class of lovely ladies on an extensive garden tour. Here they are standing in front of the butterfly garden, which has been recently mulched with rice straw. The other photo is in the Mandala garden with its flowers and various greens. You can always take a tour at Jiwa Damai, but you have to book in advance at contact@jiwadamai.net.